One book that you all should know about is Kim Purcell's Trafficked. It touches on some very important issues being addressed in the news today, human trafficking. Read on to see what it's all about! "Hannah believes she's being brought from Moldova to Los Angeles to become a nanny for a Russian family. But her American dream quickly spirals into a nightmare. The Platonovs force Hannah to work sixteen-hour days, won't let her leave the house, and seem to have a lot of secrets - from Hannah and from each other. Stranded in a foreign land with false documents, no money, and nobody who can help her, Hannah must find a way to save herself from her new status as a modern-day slave or risk losing the one thing she has left: her life." "I wrote TRAFFICKED, a story about a girl who comes from Moldova to America to be a nanny and ends up a modern-day domestic slave, because I was shocked that people could actually keep people working as slaves in their homes in this day and age. I figured that kind of thing could happen in a poorer country, but certainly not in a developed country like America. When I did more research, I learned that in most cases, these girls and women had many chances to leave or escape and they chose not to. This fascinated me because I realized then that they weren’t any different from any of us who want to do something, but we don’t, out of fear. 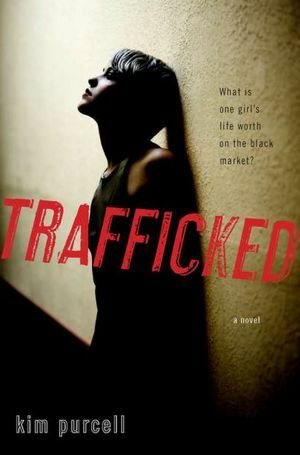 I hope that when people read TRAFFICKED, they’ll see themselves in Hannah. Maybe they’ll realize that she’s afraid, but I’m afraid too. Perhaps it will help people push out of whatever box they’ve built around themselves, so they do what they need to do. I also hope that my readers realize, as I did, that modern-day slaves aren’t weak victims, so different from us. It could happen to someone like me and it could happen to someone like them. I don’t think we should separate ourselves from people in this situation because that keeps us from seeing what’s happening right next door. If we create more awareness about the issue and more protection for people who come forward and report their traffickers to the police, we can decrease slavery in this country and around the world. Maybe when people read TRAFFICKED, they’ll be motivated to do something about this terrible problem. If nothing else, the novel will create more awareness. I hope that after people read this book, they’ll be kinder to people they meet who don’t speak English perfectly, people who might be illegal or legal, people who work very hard to make a living in this country and have so many beautiful qualities if only people would give them a few minutes of their time. Finally, my most fervent hope, a dream, really, is that some girl somewhere will read this book and she won’t ever go with a trafficker because she will have recognized some of the red flags. If just one girl is saved somewhere from this fate, it would mean everything to me." You can pick up a copy of Trafficked now! Thank you to Kim Purcell for her research and her voice! This looks like such a powerful story, and it's especially relevant nowadays. So many people don't realize what's going on in supposed first-world countries. I love What Ms. Purcell has to say about it. I think this is such a powerful and important topic. Honestly. I come from a country where human trafficking is becoming a big issue, and it has always amazed me how some people are just willfully unaware that it's happening right under their noses. Honestly, some international agencies think that the country where most human rights are violated is actually the US, because it's the biggest market for sexual exploitation and forced labor. I can't wait to read this book, I hope it's very honest about it. I've been hearing so much about this lately and it's so touching and inspiring. I am definitely itching to get my hands on a copy. I appreciate the author telling the story behind this! So inspiring.